Myst V: End of Ages has been sitting on the stack waiting to be played for a few days now while I finished up Rhem. There’s some kind of be-careful-what-you-wish-for thing going on here. In my first post on Rhem, I wondered if it would be better with a 3D graphics engine. Myst V has such an engine, and it’s causing me no end of grief. I just can’t seem to sustain a playable framerate, even when I turn all the graphics settings down to minimum. A session might start at about 20 FPS 1 All framerate figures here were obtained using FRAPS. (not great, but something I can get used to), but it always gradually decays to an inevitable plateau of 6-7 FPS, even if I return to the location where I was getting the 20 FPS initially. My machine exceeds the game’s minimum requirements in every respect, and the Ubisoft forums show that people with less powerful systems than mine have gotten it to run smoothly without problems. But I’ve gone through the measures prescribed by tech support, and nothing helps. I’m starting to wonder if I turned off some driver setting in order make an older game run and forgot to turn it on again, but I can’t find any trace of such a thing. Anyway, I’m shelving it for now. Maybe some ideas about how to get it running smoothly will turn up. 1. ↑ All framerate figures here were obtained using FRAPS. >My previous Rhem sessions, taken all together, cover a minority of the game. I have just completed the rest in a single marathon session. People who do cryptograms are familiar with the moment when the code “breaks” and suddenly you’re discovering new leads faster than you can follow up on them. Rhem and other nonlinear puzzle-based adventure games have a similar tipping point. Not entirely for the same reason: here, it’s more do do with eliminating clues than finding new ones. But both forms share the property that the more you understand, the easier it is to understand more. The chief reason for this in adventure games is that the more you see of a game, the better you understand how the author thinks. There are a few basic organizing principles in Rhem that, once grasped, make the whole game easier to think about. One is the overall structure of the map: there’s a large central area, with various drawbridges and rotating platforms and the like to make it difficult to get around, and there are various mostly-self-contained peripheral areas hanging off of it. The fact that the peripheral areas aren’t entirely self-contained, coupled with the lack of an obvious boundary between them and the central area, obscures this structure. But recognizing it is useful, not just for navigation, but because it lets you make certain assumptions — for example, that actions performed in the central area won’t affect things in the periphery. This assumption isn’t always true, but whenever there’s an exception, there’s some kind of clue indicating it. Another very big part of the author’s style is heavy use of the close-the-door-behind-you puzzle. This is one of the basic puzzles of the Myst-like genre, because it’s one of the few puzzles, other than combination-lock variants, that you can do with a one-click interface and no inventory. 1 Rhem actually has a certain amount of inventory, but it’s only used in the endgame. Here’s how it goes: A room is initially reached through a door that can be only opened and closed from the outside (typically because it’s button-operated). The contents of the room directly or indirectly grant access to an alternate route into that room. The trick is that closing the door alters the room in some desirable way — maybe there’s something written on the back of the door, maybe there’s a passageway that’s concealed by the door when it’s open, whatever. So you have to close the door from the outside, which players won’t normally do, and enter through the alternate route. Understand that I mean these words in an abstract and general way: the “room” can be a hallway or even outdoors, as long as access to it is limited, and the the “door” might be a ladder or a drawbridge or something, as long as it has two positions, one passable and one impassible, and no immediately obvious reason to return it to the impassible position. I think every single game in the Myst series uses this puzzle at some point, but Rhem really exploits it for all it’s worth, dressing it up in all kinds of guises and daisy-chaining instances of it in loops where one room’s door is another room’s alternate route. After my first session, I wrote that the game’s layout was hard to grasp, even with a map. By the end, I had pretty much internalized it, due to repeatedly running through that central area in order to get to the other side of closed doors. In the course of solving this game, in addition to the notations on my map, I covered most of one side of a standard sheet of paper with notes that will be incomprehensible to me in a month or two. Zarf’s review mentions taking six pages of notes, which I suppose shows different habits: his notes may be more verbose, and he probably wrote things down that I didn’t. In cases where I discovered information and already knew where it was to be used, I often just temporarily committed it to memory. Consquently, the bulk of my notes were taken in the beginning, when I didn’t yet understand anything. But also, in many cases I circumvented note-taking by taking screenshots. This isn’t something I often do in adventure games, but Rhem pretty much asked for it: several points showed complicated screenfulls of data that I didn’t yet know how to filter into something simple to copy down. And, being old and written in Macromedia Director, the game switches to the background quickly and without hassle, making it easy to switch to an image viewer whenever I wanted to check on stuff. My map is based around two screenshots of partial maps found in the game, assembled in an image editor and printed out so I could write on it. Anyway, I have to agree with what pretty much every review of Rhem says: it’s great stuff, if you like this sort of thing. It’s all a big complicated system made of rusty piping and cinderblocks, and the joy of the game is in coming to understand that system. 1. ↑ Rhem actually has a certain amount of inventory, but it’s only used in the endgame. More importantly, the same area seems to be the motherlode of cryptic hints. A machine labeled “SIMULATION” displays shapes, which change into other shapes at the press of a button. Another machine with a keypad dispenses sheets of paper with rows of pixellated runes, some labeled with numbers. 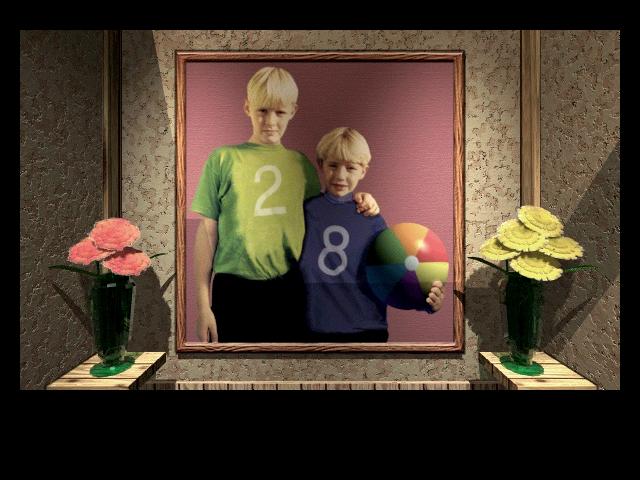 Even a portrait of two young boys seems like it’s hiding a message, if only I knew how to begin interpreting the colors. Some of this is clearly connected to things I’ve seen before, although the nature of the connection is obscure. It’s all in one small room, not like the large explorable areas outside. The thing is, I may well be laughing at this a day or two from now, after I discover the real cryptic hint motherlode. Every time I sit down to play this game, I make substantial progress in figuring things out, but still wind up with more mysteries than I started with. I think I’ve gotten just up to where I stopped playing Rhem the first time. 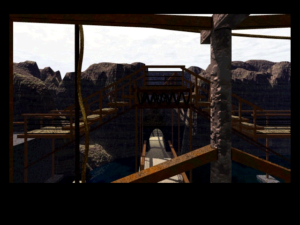 My last major accomplishment was setting everything up correctly in a control center for a system of pipes, allowing water to flow where I needed it in order to gain passage to the second major section of the game. Getting the right settings involves piecing together information from four other places, information partly in the form of unexplained symbols whose meaning and significance has to be derived from context. For my money, this kind of inductive reasoning is the essence of the genre (both adventure games in general and Myst clones in particular). And it stands in contrast to the sort of reasoning needed in DROD and other rules-based puzzle games. In those, you pretty much have complete information about how all the elements work. The challenge is to figure out the consequences of what you know. It’s very mathematical. Rhem, on the other hand, is scientific: you start with incomplete information, and have to notice patterns in order to figure out how to complete it. Or perhaps a better metaphor would be reading uncommented source code: all the symbols were presumably meaningful to whoever made them. 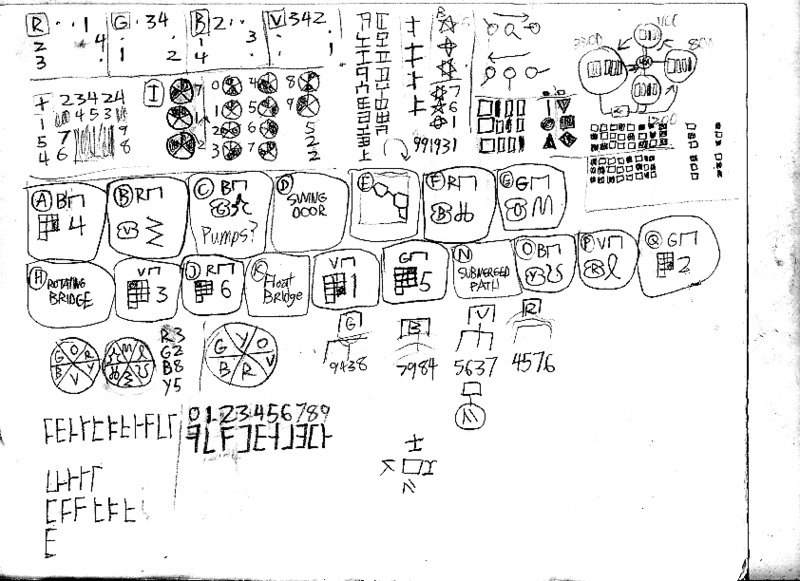 Heck, it’s not all that different from the ad-hoc notation I’ve been using to take notes while playing the game. 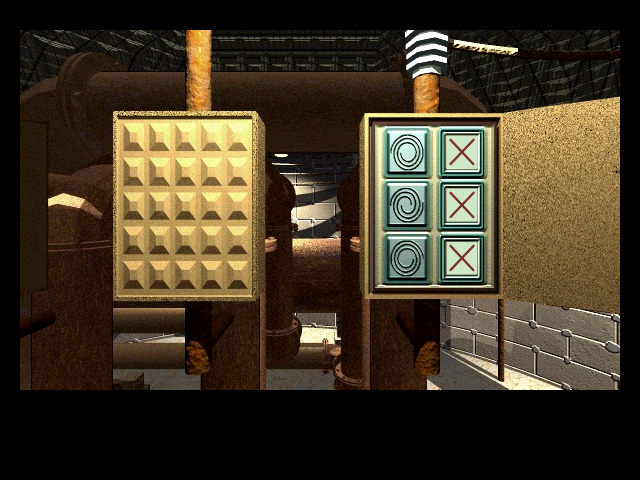 There are certain fixtures repeated throughout the map, comprising seven buttons arranged around a screen; press the right buttons in the right order, and you get what I can only assume is a clue for a puzzle I haven’t encountered yet. When I encounter one, I note it on the map with a special glyph, a simplified representation of its shape. 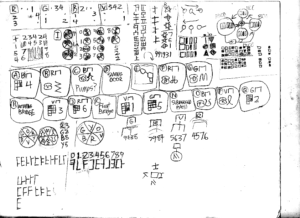 I could imagine someone else finding my map and being as puzzled by these symbols as I am by the symbols in the game. When I said yesterday that I wanted something more thinky, what I was planning to do was pick up a copy of Myst V: End of Ages at one of the various retailers I pass on the way home from work. But it turns out that it’s no longer on store shelves (although, for some reason, Uru: The Path of the Shell is.) I have already made other arrangements to acquire it: as a completist, I definitely want to finish the Myst series sometime, even though the series seems to have peaked at Riven. But in the short term, I’ll have to make do with the next best thing: a blatant Myst imitation. Fortunately, I have several. Rhem is one of the better ones, and in some respects utilizes the form better than any of the actual Myst games. Andrew Plotkin’s review does a good job of explaining this. I honestly don’t know if I’ll have anything significant to add to what he says. I will note, however, that while his review talks at some length about three CDs and overcoming the need to swap disks, the game was later re-released on a single CD, apparently the result of better video compression. This is the edition I’m playing. My history with Rhem is typical of my experience of graphic adentures. I started it, got a good way into it, got stuck, got distracted, and set it aside to finish later. Well, this is not a game that you can just abandon for a week and remember enough of to keep playing. Some time later, after some system upgrades, I tried to play it again, but hit strange technical problems. The publisher’s tech support was unable to help me, as is usually the case with games more than a year or two old. Whatever the problem was, subsequent upgrades seem to have fixed it. (I love it when that happens.) I have of course forgotten most of the game, but I have a vague recollection of what I did before that makes it a little easier to figure out what to do. Faded familiarity does not, however, make the map easier to navigate. Talk about twisty passages — Rhem is made largely of catwalks and stairways that cross over and under each other a lot, ruining my sense of where I have and have not been already. The game provides a partial map at one point, and I’m relying on that a lot, when I can figure out where I am on it. Annotating the map with the locations of stairs helps a lot. I may wind up making a simpler map that only notes junctions, once I have a better handle on the layout. As much as the author has tried to ease navigation within the framework of a Macromedia Director adventure game, I really think this aspect of the game might be served better by a full 3D engine, where continuity of motion would make it easier to keep track of which peripheral objects are which. Or maybe not: it would slow down movement, now handled by swift mouse clicks. Besides, it’s not like the author had the time or the budget to develop such a thing. This is another of those indy efforts, sold at first exclusively through the author’s website, and I’m glad that he chose to devote his efforts towards a game rather than a new engine. But the point is, Rhem is conceived as a continuous three-dimensional object, and understanding how that object is put together is crucial to figuring out the game. I made comments to this effect about The Neverhood, but it’s even more true here. Levels 6 through 9 of Serious Sam: The Second Encounter are set in ancient Babylon, which is presented as pretty much like Central America with minarets. (Which aren’t historically appropriate, but this really isn’t the kind of game where you complain about that sort of thing.) The gameplay is basically more of the same, including hunting up weapons afresh, as they were all lost at the end of level 5. The sniper rifle becomes available early this time round, and it’s a good thing: there’s one part involving a cluster of buildings in the middle of a vast expanse, and I’ve found that the easiest way to approach it is to go off into that expanse and pick off the monsters from a long, long way away. I’m most of the way through level 6 right now, but will probably put off playing more until later. I do want to finish the game, but it’s a bad follow-up to DROD. Both games involve repeatedly dying and reverting to your last save, but when you fail in DROD, you rethink your approach, whereas in an action game like Serious Sam, usually all you can do is try the same thing again and hope you can dodge that missile this time. There is a tactical element to Serious Sam, but it’s not all that deep. Just now, I require something more thinky and less shooty. 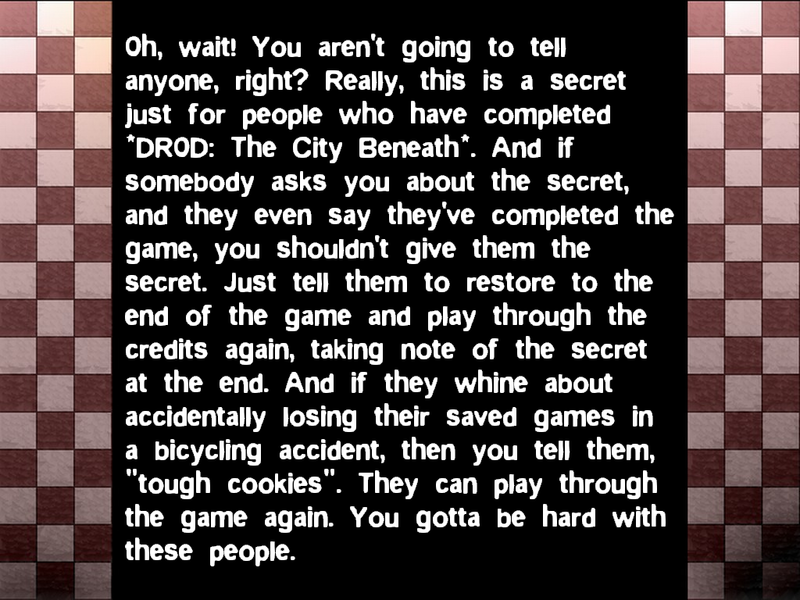 I have completed DROD: The City Beneath, seen the final revelation at Lowest Point, and learned the secret handshake, and am currently in the process of hunting down the secrets I missed (which is easier after you’ve won, because the game then tells you how many secrets there are on each level). This will probably be my last post dedicated to this game, so let me end in what seems to have become my customary way, by iterating through a list of unrelated points that I didn’t get around to making full posts about. First, I wasn’t kidding about that secret handshake. When you finish the game, it gives you a little ritual you can use to identify other people who have finished it. This is kind of fun: it gives a sense that I’ve passed an initiation trial and am now a member of an elite brotherhood. The last time I got this feeling from a game was when I finished the special Grandmaster ending to Wizardry IV, and sent off for the special certificate available only to Grandmasters. Second, I think the demo is misleading. The demo consists of the first few sections of the full game, which has a large amount of introductory material and a proportionately small amount of puzzle-solving. Since there’s no hard division between cutscene and gameplay in this game — there is a division, but it’s rather soft and permeable — this has led some people to think that this is representative of the entire game. Well, there are occasional scripted scenes throughout the game, but the first section of the City is the only area dedicated mostly to wandering around, looking at stuff, and gathering information without solving puzzles. Third, I know I’ve already devoted a post to the improvements that TCB makes to the DROD user interface, but there are two things I haven’t mentioned that really deserve a nod. One is the “battle key”, which is one of those little things that, once you’ve tried it, you can’t imagine doing without. It’s a key (numpad + by default, although you can reconfigure that) which, when pressed, does the opposite of your previous move. That is, if your last move was to swing left, it swings right; if it was to move north, it moves south. Pressing it repeatedly alternates between two opposites — for example, swinging left, right, left, right, etc. This is exactly the sort of action you need to clear out a large number of roaches that have accumulated while your attention was elsewhere. In previous versions of the engine, you had to twiddle two keys to do this, and it was easy to miss a beat and get killed. It’s a little thing, but good UI design is built out of little things. My other favorite new feature is the ability to right-click on any tile to identify what’s on it. This is especially useful when hunting for secret rooms. Nearly all secrets are hidden by breakable walls that look almost like the walls around them. While it’s possible to spot these by scrutinizing the graphics, I find I’m often unsure in my assessment. Sometimes it’s easy to just walk over and give the wall a poke to test it, but sometimes the uncertain spot is only reachable by, say, clearing the room of tarstuff in order to make a gate open. It’s good to know in advance if it’ll be worth the effort. Finally, let me talk about the story a little. Beethro starts the game in search of two things: his nephew Halph, and answers. He finds Halph about halfway through the game, for all the good it does him. Answers are less forthcoming: despite the fact that the Rooted Empire’s explicit goal is knowledge, no one actually knows anything. Knowledge is valued as a treasure to be stored away in the stacks, where it sits and decays unregarded. Citizens are vat-grown for specific jobs, and, with the exception of a few rebellious individuals who help Beethro on his way, show little curiosity about anything beyond the tasks assigned them from higher up — or rather, lower down, as the seat of the Empire is at Lowest Point. Meanwhile, it becomes clearer and clearer as the story goes on that the entire system of the Empire is insane, not controlled by anything intelligent, held together only by paranoia and a willingness to not question it. As the Journey to Rooted Hold theme song put it, “Outside the walls, there wait our foes… Let each not speak that which he knows”. In one respect, this makes Beethro’s quest futile: if the Empire is simply irrational, there can be no explanation of why it does what it does. There may be comprehensible motives for individual factions, such as the Archivists (who want complete knowledge) and the Patrons (I have no idea what they’re doing, much less why, but they seem to be opposed to the Archivists). But for the Empire as a whole, there is no reason why. So we’ll have to be satisfied with understanding how. How it all got to be this way. How it was before. The end of the game provides a very big clue (which I won’t spoil, except to note that it reminded me of something in one of the Ultima games), but we’ll have to wait for the next game to get the full story. And that’ll be several years from now. 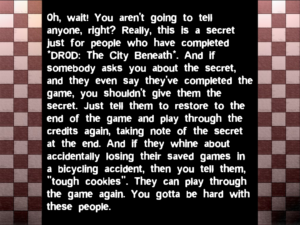 According to the end credits, the authors are going to take a break from DROD and do some other game next. To look at him, Beethro is a lunk with a sword. But his is a world where battles are puzzles. He’s plain-spoken, even anti-intellectual at times, with no patience for the snobbery of the Empire. But when all is said and done, he’s the only person in the Empire with any inkling of what’s really going on. Which makes him a better seeker of knowledge than any of them.